paint your bedroom door blue, print off and stick on and you have your very own tardis - For those who dont know, this sign is on the little hatch that houses the telephone, and does not refer to the door, which pushes inwards. click the download button for full high res version - or just click on the pic. thanks very much for publishing this, I used it for political prosocial aim, at address below. Hi, I used it here: cd-mm.deviantart.com/art/TARDI… Nice work! Yes - what I mean is that it's not phrased correctly. It used to be that they responded to urgent calls, not all of them. Fantastic job, like it's right out of the show. The Doctor always pushes the door! different door. the sign is for a small hatch that contains a telephone. There's actually a scene where someone points out to him that the doors to a police box (the ones you open to go inside) are suppose to open inwards and that the Doctor has essentially been ignoring the instructions he passes every single day and using the doors wrong for a thousand years. His response to remind them that it's his ship and he'll open it however he wants. They are suppose to open *outwards, that is. Cool! I want a tarids room now! Used as a reference for: [link] Thank you! Can you make a sticker of the circular sign on the right? Hi, may I please use this as my icon? sure, just link to me here somewhere. Thanks! Was meaning to make one of these myself but was procrastinating. i've already painted it, now i'll print this and i'll have a tardis on my room! THANK YOU!!!! I have this on my bedroom door. your watermark is very tiny.. I'll have do do this! They also have TARDIS Converse! 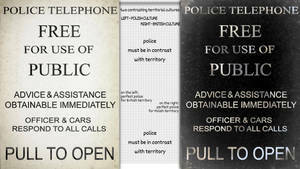 THE TARDIS: "There's a sign on my front door, you've been walking past it for 700 years, what does it say? " THE TARDIS: "There's an instruction at the botton, what does it say?" THE DOCTOR: "Pull to open"
THE TARDIS: "Yes and what do you do?" THE TARDIS: "Every single time, 700 years, police doors open out the way.."
SEE! IT SAYS 'PULL TO OPEN' RIGHT THERE! from the description - "For those who dont know, this sign is on the little hatch that houses the telephone, and does not refer to the door, which pushes inwards." I know that! I was talking to The Doctor!